It is an original and convenient menu to operate devices. To see the menu just hover mouse over system tray icon of the program, or left-click to the system tray icon or press a hotkey (how to specify a hotkey you can find here: Hot-Keys). To stop a device just left click the mouse on the selected device. To stop all visible devices on the menu just press this button: and the program will carefully stop all your devices that you see on the menu one by one (hidden from the menu devices will not be stopped with this button). If you have programs assigned to launch before stopping to a visible device they'll be also launched as with usual single device stopping. You also can use a hotkey for stopping all visible devices (how to specify a hotkey you can find here: Hot-Keys). 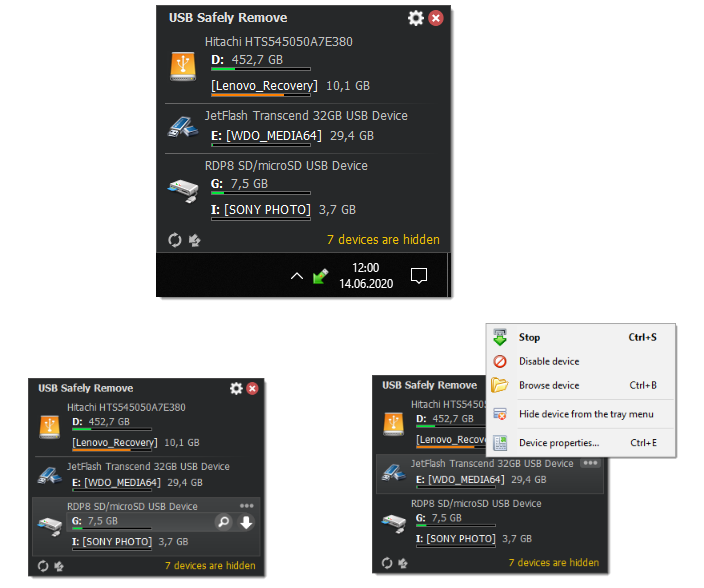 To eject separated memory card of a card reader hover mouse over a card reader (a device with ( ) sign on the left-hand or right-hand side of its item), in a short time you will see the popu menu with the list of connected memory cards, just left click on required. Return stopped device back! if a device is stopped, but is not unplugged yet, it will be displayed in the menu, but its icon will be red-crossed. Just righ click on the device and it will be returned back into the system! Scan for hardware changes; if you have a SATA or eSATA drive which cannot be automatically detected by Windows on its connection you should use this feature to ask Windows to scan for newly connected devices. Just press this button: and Windows will detect your SATA drive and let you use it. Almost all previously mentioned operations, particularly device stopping and browsing of its drives can be done without any touching the mouse - only using the keyboard! To stop a device call the menu with a hotkey (Win+S by default), then choose a required device with "Up"\"Down" keys in the displayed menu and press "Enter"
To stop all devices at once press a specified hotkey (you should enable it in the Options -> Global Hotkeys -> Use "Stop All" Hotkey section) while you are staying in any application. Read more in Hotkeys section.